The glitz, the glamour that is the Gold Coast!……..Finally. After an unplanned but pleasant week in Coffs Harbour the weather improved enough for us to leave on Thursday morning, so we promptly left close behind another yacht Escape Pod with Peter and Nicole onboard. We leapfrogged with them all night but it did provide some comfort knowing that we weren’t the only ones out there dodging trawlers and tankers! We saw a sea turtle, cruising the EAC; another whale and quite a few dolphins. For the twitchers amongst you we have also seen sea gulls (boring! ), a few albatross or maybe they were shearwaters (not sure as Jo is still twitcher in training) and possibly an Australasian Gannet or two… hmmm, next time we will have to have the bird book closer at hand. After arriving in Southport we anchored in what is just known as “Bum’s Bay” (due to all the ‘Bums’ that use to anchor there permanently; until they put a time limit on length of stay) behind the Seaworld Resort, exhausted but keen to get off the boat for a night we prettied ourselves up as best we could and went out to a lovely dinner at the casino with Jo’s Uncle Ray and Aunty Diane. We did try today to make our way up the Broadwater thinking we might take the inside route to Mooloolaba but after hearing a yacht call Marine Rescue yesterday to report that they had become stuck hard in shallow water mid channel near Jacobs Well, we ourselves only got as far as Jacobs Well before also touching bottom. Fearing this might be the case we had approached very slowly and were able to reverse off. We tried again 4 or 5 times to find enough water but despite being sure we were in the channel we kept hitting even though there is supposed to be at least a 2m of water and we only draw 1.65. With a low tide expected in an hour we made the decision to turn around and head back to Bum’s Bay. 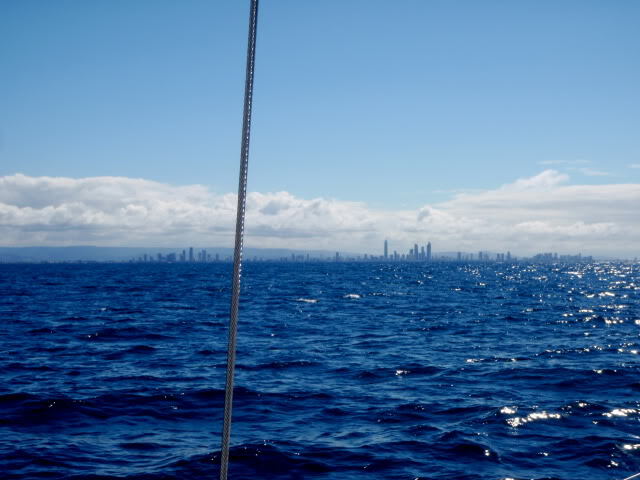 Tomorrow we will leave for Mooloolaba via the big blue to try and make up some lost time. We left Sydney early last friday morning in the dark for Port Stephens in fairly lively conditions. After a couple of hours of being thrown about like a washing machine and after the third of fourth wave to completely drown the cockpit and its inhabitants, we promptly turned around and went back into Broken Bay and spent the night in the Basin. Our Journey north had begun, we had only made it three miles but slow and steady wins the race! The next morning, refreshed and more prepared with calmer seas we again set off for Port Stephens getting into Nelson Bay about 3pm. With a day off the next day to refuel and have a wander around Nelson Bay, we then left for Coffs Harbour Monday morning. Sophie seemed to quite enjoy her first overnight passage, plenty of dolphins and a whale kept us company, as we fought with the EAC dude( Finding Nemo reference for those not into Disney films)! It is at it’s strongest at this point on the coast, and despite the Boat flying along at a 7.5 knots we were only making 4 knots speed over the ground. We have safely arrived in Coffs Harbour, but look to be be stuck here until probably Thursday with big seas and strong winds for the next few days. We were going to head for the small town of Yamba next, but with the delay here and time getting away from us we will probably do another overnighter into Southport on the Gold Coast.